Investing into innovative products developed by startups through posit offices, reducing merchant fees by allowing products to be paid through post-pay direct payment, and ‘one-stop crowd funding’ received through a parcel service will be made available soon. It will be also made easier to donate to social groups through post offices. Korea Post has started creating ‘Crowd Funding’ platform to establish itself as a national innovative growth platform. Crowd funding is a method of raising funds from unspecified number of individuals and it is useful for startups with lack of initial capital and social groups. Korea Post is looking to create crowd funding infrastructures by using partnering organizations and infrastructures in South Korea. It is looking to prepare points of contact with South Koreans by inviting donators, sponsors, and stock firms to its homepage and mobile channel. 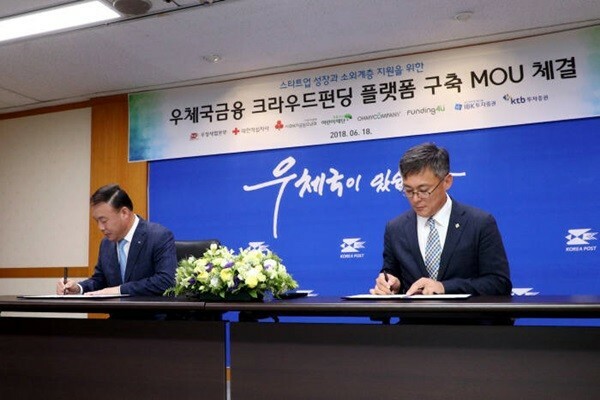 Donation and sponsor-type platforms will be connected to Korean Red Cross and Community Chest of Korea and they will look for families that need help and support them financially. Stock-type platforms will be connected to IBK Investment & Securities and KTB Investment & Securities and they will look for startups and support them initial funding and receive amount of investments in later days. Korea Post is planning to provide its entire infrastructures to startups and social groups such as providing them with post-pay direct payment so that they can pay lesser amount of fees. It is expected that Korea Post through its crowd funding will contribute in supporting growth of startups and underprivileged groups. Korea Post’s goal is to be more active in creating ecosystems for startups from many directions. It is going to give prize money and look for innovative ideas at the same time by holding a hackathon event for startups. It was able to find new business models and ways to improve its image by holding a hackathon event for FinTech companies. It is going to look for ideas of making deliveries using drones and electric vehicles more efficient through hackathon events for intelligent distribution companies. “We are going to help the weak and innovative startup companies by establishing crowd funding platforms through our financial infrastructures.” said Department Head Kang Sung-joo of Korea Post Headquarters.